Salon Dashboard, Salon business intelligence - What is Intersalon? The Intersalon dashboard is essentially a snapshot of your salon's health. Graphs and tables provide a quick summary of no-show issues, new customers and financials. You can also use the Dashboard to quickly check-in customers - and spot today's potential 'no shows'. 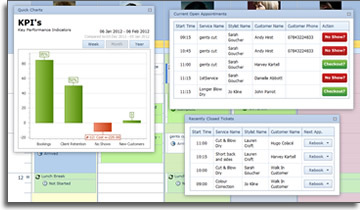 The Dashboard works around your salon, and widgets contain the information that matters to you. It's also highly customisable - so if there's some data you'd like to add, it probably can be! We want our customers to get the most from Intersalon, but we also know how easy it is to get lost in salon management software. We've designed Intersalon to try and alleviate the difficulties experienced on traditional software packages. Intersalon milestones give a summary of your usage of the software. It also highlights areas where Intersalon can make your life easier. We love adding new features to Intersalon, but sometimes its hard to alert our customers to these exciting additions. As part of the dashboard, our 'Whats new' section takes you though each new feature step by step. We keep this section up to date with all our software updates, so you'll always know which new features are on the way. In the latest version of Intersalon - a free automatic upgrade - we've extended the Intersalon Dashboard to include comparitives. See how your salon performs against our national averages, and where there could be room to improve. We've added a basic module guide to your new Dashboard. This gives a brief synopsis of each area of the software, and should help you find what you are looking for. We love our customers! We've created new support discussion boards and feedback portals with our friends at getsatisfaction and zendesk . Talk to us and talk to our other customers - all aspects of salon software and the industry as a whole are covered, and we'd love for you to get involved. We've added instant easy access to the portals from the new Intersalon Dashboard.